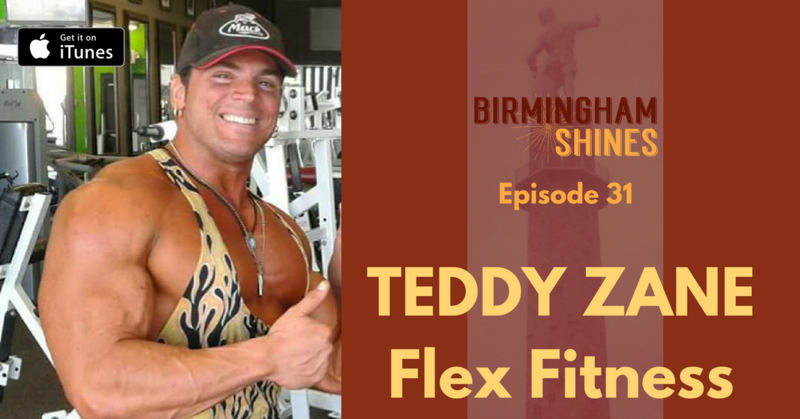 Teddy Zane, owner of Flex Fitness in Irondale, is the guest on episode 31 of Birmingham Shines. Health and fitness starts with food. “You can’t outtrain a bad diet,” Zane says. Teddy is an ACE certified trainer. Flex Fitness is an awesome gym in Irondale, a suburb of Birmingam, with 24/7 access. Flex Fitness offers a full range of cardio workout machines, as well as multiple varieties of circuit training machines. There’s a full floor of free-weights for the hard-core bodybuilders, but Flex Fitness really emphasizes fitness for everyone. Some folks don’t get the results they want because they quit too soon when they don’t get the results fast enough. Patience is a key and you also have to pay attention to what you’re eating. Most of us can’t get all the vitamins, minerals, amino acids that we need, even if we’re eating reasonably well. So it’s not just about what you’re will to give up and a commitment to eating the right combinations and quantities. You also have to pay attention to the quality of the food you’re taking in. Industrially-produced poultry and beef, farmed fish, these receive food that’s largely corn-based. As a result, you don’t get the Omega 3 fatty acids and other benefits of grassfed, pastured livestock. Teddy recommends intermittent fasting to help detox body and restore gut health. This is not the solution for someone with a medical condition, but for a normal healthy person intermittent fasting can be an excellent tool for restoring colonic health and intestinal function. With intermittent fasting, you go 12 hours, usually overnight, with no food intake to give your digestive system a rest. Drink a lot of water, especially in the morning after, to help flush out toxins. Food and fitness are the fountain of youth. Set a goal. Identify your goal and a reason to achieve it. If you can’t manage your self-discipline, get a trainer. Not mandatory if you can stay committed to your plan, but a trainer is great to keep you motivated. Ask people in great shape to help you. It’s better to talk to a real person–even a friend who’s knowledgeable–rather than just going to YouTube or a website for motivation. Be consistent. Don’t be sporadic. Your body adapts quickly, so you want to keep moving forward. Bodybuilding is for the extreme-fit enthusiast. Most people just want to focus on cardio to get rid of stored body fat. A key to maximize fat-burning is to work out on an empty stomach and you must get your heart rate up (more on that shortly). Drink lots of water. Take a branch-chain amino acid supplement before your cardio workout. Branch chain amino acids usually come in powder form. Take before the workout, on empty stomach, to preserve muscle and burn fat. For strength-training, want to have a couple of meals in the day before your strength workout. Ideally, do your cardio early, on an empty stomach. Make sure you get your heart rate up to the right level, based on age. A heart rate monitor is crucial for making sure you hit the right threshold in cardio to burn fat. Then have 2 meals before strength training. Do your strength 2 p.m. or later, after you’ve had good nutrition. Flex Fitness is located on Crestwood Blvd. in Irondale. Irondale is (as some of you may know) the hometown of the Irondale Cafe, which inspired The Whistlestop Cafe in Fannie Flagg’s book, Fried Green Tomatoes at the Whistlestop Cafe. Chef Tony Bayles started out working with food when he was an assistant to his uncle who ran a catering business. 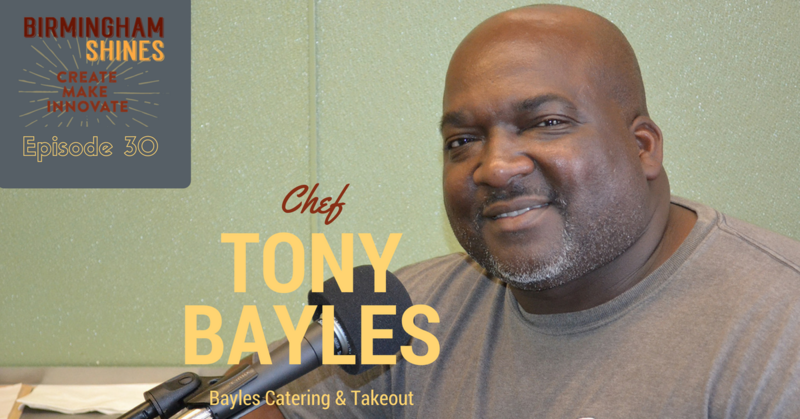 Today, Tony owns Bayles Catering and a popular take-out cafe in the Woodlawn community, which is in the midst of a community revitalization that’s turning into a renaissance. In this episode of Birmingham Shines, Tony shares the story of how he decided to become a professional chef, a bit about his history and training, the types of catering services he provides, and what makes the community of Woodlawn and the city of Birmingham Shine. We also talk about bowling. Enjoy! Welcome to episode 29 of Birmingham Shines. I’m your host and producer Sheree Martin and this week’s show is about TEDxBirmingham: what it is, why it matters, who it’s for and more. We also talk about what makes Birmingham Shine and what makes a person shine. 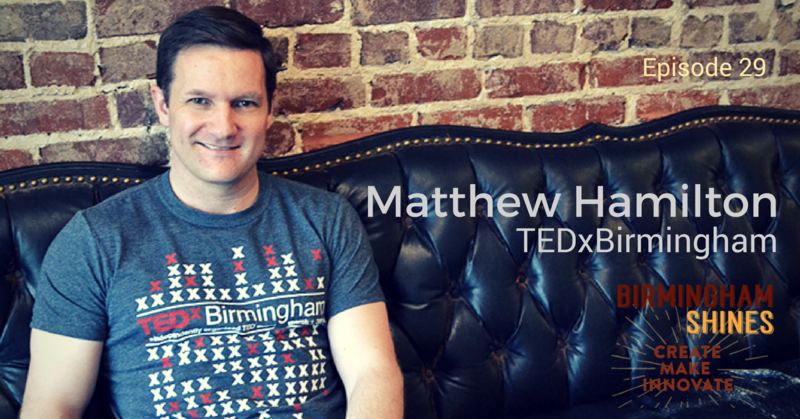 My guest is Matthew Hamilton, someone I’ve been trying to have on the show since last summer and we finally had a chance to sit down just before the beginning of the year to talk about TEDxBirmingham. I’m a huge fan of TED talks and TEDx talks and use them to learn, find inspiration and spark my own innovation and creativity. TEDxBirmingham 4th edition is set for March 12 and the leadership team just announced this year’s speakers a few weeks ago. Matthew and I talk about the importance of TEDx events in the life of a community and the goals of TEDxBirmingham in particular. I ask Matthew to highlight a few of his favorite speakers from past TEDxBirmingham events and you can find videos of those talks on the Birmingham Shines blog. He also gives us a preview of this year’s speaker line-up. You can apply for tickets right now through tedxbirmingham.org and Matthew explains the selection process in our conversation around the 43 minute mark. The deadline to submit your application is January 31, so only a few days left to apply for tickets. But you can also participate via the free livestream if you can’t attend in person. Why does TEDx matter? Matthew says it creates a forum in a community where a diverse group of people can come together and share ideas. The TEDx event can be a spark or catalyst for innovation. Tt’s the sharing of ideas and bringing people together to connect that is the service TEDx events provide to a community. The focus or mission of TED is to bring to light Ideas Worth Spreading. I like to think that my hero Benjamin Franklin would have been one of the forces to bring a TED-type of event to life. His Junto is probably the closest thing to a TED-type of event that existed in the colonies in the first half of the 18th century. Matthew is a co-organizer with Dr. Sarah Parcak of UAB, who’s a TED Fellow. In curating the speakers for TEDxBirmingham events they try to focus on ideas that matter coming OUT of Birmingham, more than ideas about Birmingham. “We want to share ideas that are originating in this city, out to the world,” Hamilton said. One of the criteria used by the TEDxBirmingham organizers for speaker selections is that the idea is one that would be relevant to someone regardless of geography. The idea is not specific to Birmingham or relevant only to people in our city or region. Matthew used the example of Dr. Pat Hymel’s TEDxBirmingham talk from 2013, which focused on how we grow and learn from our mistakes. This year’s TEDxBirmingham has the theme of Pure Imagination. In curating speakers for this theme, Hamilton says the idea was to find speakers who consider the possibilities for the future with an emphasis on WHEN, not if. Once we finish talking about TEDxBirmingham, past and present. Matthew shares some of his thoughts on how and why Birmingham Shines: It really comes down to the people. What makes someone shine personally? A similar theme echoed by other guests: A willingness to step out and do the thing you’re passionate about. Nelson Brooke has served as Black Warrior Riverkeeper since 2004. The nonprofit Black Warrior Riverkeeper organization provides leadership in protecting the Black Warrior River, one of the primary sources of drinking water to the City of Birmingham and several other surrounding municipalities and public water systems. Nelson explains why water is so important and how the modern “disconnect” from water contributes to the lack of public awareness about the importance of protecting water. Episode released December 30, 2015. We take a look at some of the challenges of protecting water in Alabama. We also discuss briefly some of the hidden costs that we incur personally and as a society as a result of failure to enforce existing water quality regulations and the failure to update water protection regulations. For instance, many pharmaceuticals and emerging chemical hazards aren’t yet covered by the regulatory system or treatment protocols. We are exposed to these chemicals that persist in drinking water and this exposure contributes to the increased rates of cancer and other health problems. We collectively incur the medical costs of treatment of these health conditions and it might be less expensive to remove the chemicals from the water supply, or find ways to limit the discharge of these products into rivers, streams and reservoirs. We also touch on the role that our natural environment plays in outdoor recreation and the economic opportunities this offers. Episode released November 20, 2015. Original blog content released the same date. In this episode, released October 2, 2015, we talk about Rebecca’s journey to green and clean, in cleaning and in eating. This episode (#26) marked the end of season 1 of Birmingham Shines. Season 2 will begin in November. Rebecca’s line of cleaning products are free of the typical synthetic chemicals we find in industrial cleaning products. Rebecca uses things like vinegar, baking soda, herbs and fermentation to create her products, which she sells at Pepper Place Saturday Market. Episode 25 was released October 15, 2015. August 2018 Update: Scott and his wife, Jess, moved away from Birmingham in 2017. Please support Birmingham Shines podcast and all of the Shinecast® resources and media content through Patreon. Visit http://birminghamshines.com/support to go directly to the Shinecast Patreon page. Episode 24 was released October 1, 2015. You’ll probably only get an episode every other week during the month of October. That’s something I’m contemplating. If you want to keep up to date to know for sure, please visit http://birminghamshines.comand sign up for the email newsletter. You can find the sign-up form just below the player on any episode page. Lawrence Sheffield knew from a young age that he wanted to work with his hands, his heart and his mind and that college was not in his plans. His love of woodworking inspired a vision to start a training program to help young men learn both job and life skills through woodworking. That vision led to the creation of Magic City Woodworks, a 501c3 nonprofit in Birmingham, Alabama. Lawrence is my guest on this week’s episode of Birmingham Shines, along with Jacob Pierce who serves as the volunteer coordinator for Magic City Woodworks. In this conversation, we talk about the importance of doing meaningful work and the life lessons that can be learned through woodworking and other trades. One of the most important books I’ve read in the past 5-6 years is Shop Craft as Soulcraft by Matthew Crawford. When I discovered Magic City Woodworks through Instagram I knew I had to reach out to these guys and learn more about what they are doing. I’m so glad I did. I think you’ll love this conversation. Episode released September 10, 2015. Teresa Thorne has since retired from City Action Partnership. 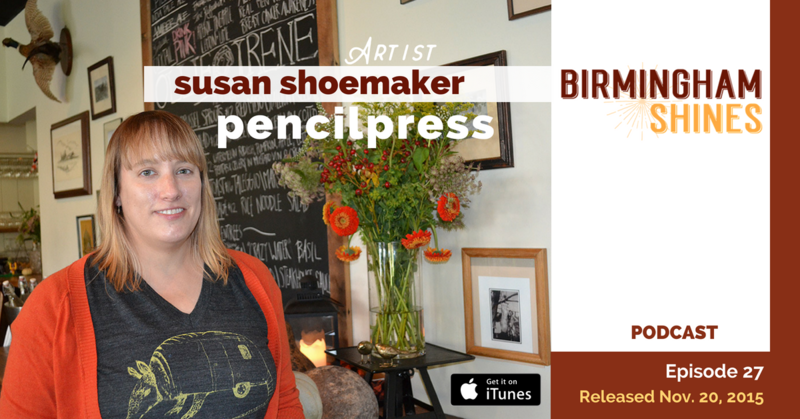 Teresa is a former Birmingham police officer and she shares some of the reasons she thinks downtown Birmingham Shines. I’ll be publishing another part of our conversation in a future episode that focuses on Teresa’s writing. She’s a successful author who’s published several acclaimed books under her pen name, T.K. Thorne.